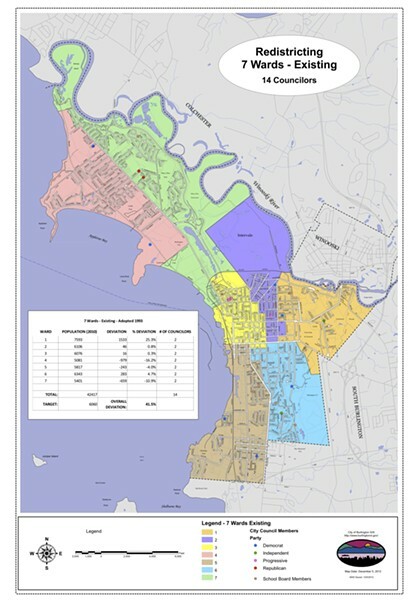 After 10 months of debate over how to redraw its own electoral districts, the Burlington City Council agreed in concept Monday night to a plan that would shrink the body from 14 members to 12. But even after it became clear the plan would move forward, the council found something new to bicker about: precisely who came up with it. One faction credited Burlington resident George Gamache, who died in July. Others credited resident Robert Bristow-Johnson. Another said Mayor Miro Weinberger came up with the plan, while yet another said it was "drawn up at the 11th hour by councilors" and wasn't properly vetted by the public. Whoever conceived of it, the proposal was brought to life by an unusual faction of Progressives, Democrats and the council's sole Republican — all of whom hail from the city's New North End and Old North End. Democrats and independents representing the city's more southerly wards opposed it. The vote was 8 to 6. The plan will now go to the council's Charter Change Committee, which will flesh out its details. If the council approves those, voters will have a chance to approve or reject it next March. Describing the new plan as a "hybrid" of two other proposals, Councilor Tom Ayres (D-Ward 7) said it simultaneously achieved the goals of preserving smaller, representative wards and creating a "smaller, more deliberative and less long-winded city council." Currently, the city is divided into seven wards, each of which elects two councilors. 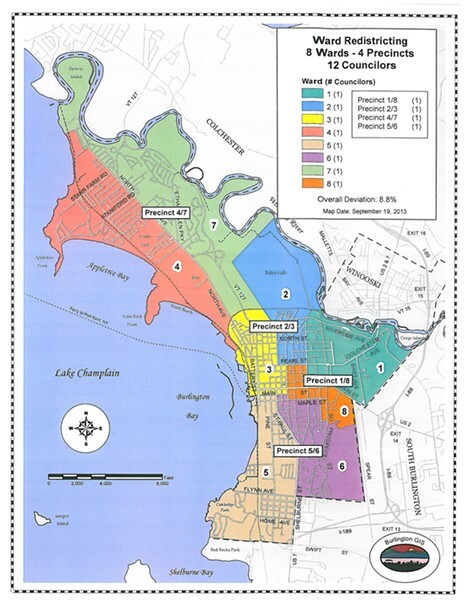 The plan Ayres and his northerly comrades backed would add an eighth ward in the vicinity of the University of Vermont, around which much of Burlington's recent population growth has occurred. Under the new plan, each of the eight wards would elect one councilor. Four larger districts encompassing two wards each would elect one additional at-large councilor apiece, for a total of 12. That, argued Councilor Norm Blais (D-Ward 6), would be "confusing, convoluted, complex." In Blais' view, "Simple problems lend themselves to simple solutions." The problem, he explained, is that while Burlington's student-heavy neighborhoods have grown rapidly, the New North End has failed to keep pace. To ensure equal representation, Blais said, the most sensible solution would be to preserve the current model and simply shift existing ward boundaries to adjust for the population changes. But Councilor Dave Hartnett (D-Ward 4) pushed back against Blais' reservations, saying, "Any plan can be confusing and complicated if you don't support it." Councilor Paul Decelles (R-Ward 7), meanwhile, said that Blais' proposal amounted to "gerrymandering" and would result in nothing more than Democrats picking off another seat in the traditionally more conservative New North End. For her part, Councilor Sharon Bushor (I-Ward 1) advocated for yet another solution: an eight-ward map with 16 city councilors. Smaller wards represented by more councilors, she said, would produce a more representative system. 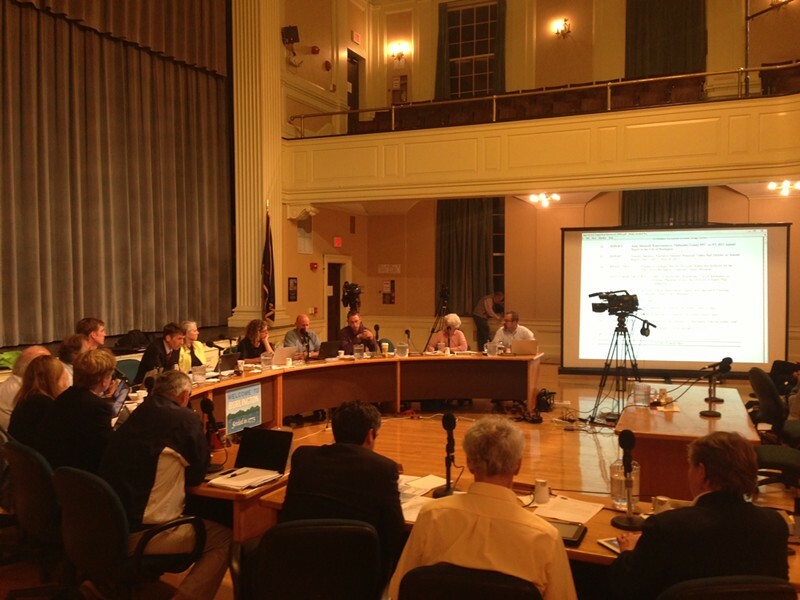 "I think this should be better thought out," Bushor said of the 12-councilor proposal. Joining Bushor and Blais in voting against it were Councilors Kevin Worden (D-Ward 1), Joan Shannon (D-Ward 5), Chip Mason (D-Ward 5) and Karen Paul (I-Ward 6). Voting yes, along with Ayres, Hartnett and Decelles, were Councilors Jane Knodell (P-Ward 2), Max Tracy (P-Ward 2), Vince Brennan (P-Ward 3), Rachel Siegel (P-Ward 3) and Bryan Aubin (D-Ward 4). Weinberger also supports the proposal, his chief of staff, Mike Kanarick, said Monday night.